Wouldn't You Like To Know What's Inside Ralph Lauren's Garage? Oh, gosh, of course! So: the Ferraris are mainly red, the Jaguars are dark green, and the Porsches are black. This is what a lifetime of selling ties got Ralph Lifshitz. All of them have been maintained carefully since new, or restored to perfection-sometimes beyond perfection, since a few have been painted in colors that are a slight tint off from the original, changed to something almost the same but with a subtle difference that is more pleasing to the owner's eye, and some have been given new leather that not only looks better than the old but in most cases is better. That aspect of the collection, the way the cars have been turned into slightly idealized versions of themselves, is a key to the owner's sensibility, since making better versions of classic objects, re-creating pieces of clothing, furniture, and design so that they will look even better than the image of them we carry around in our minds, is exactly what Ralph Lauren does for a living. He has earned a vast fortune packaging the look and feel of wealth in a way that appeals to the mass market, and he has been astonishingly successful at it, not because he has cynically plotted to figure out what sells but because he has been so willing to let his own fantasies determine what he makes. Lauren says of some Bugattis that he had repainted from light blue to black, "I wanted to restore them as I thought they should ideally be." 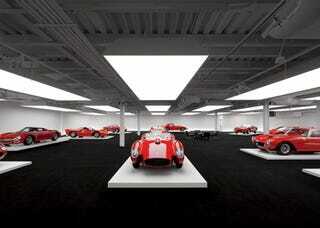 The fashion designer's garage is located in Westchester, New York, near his 273-acre Westchester estate. The storage space, offered for sale by a local luxury car dealer, was actually a consolation prize of sorts: Lauren's original vision was to create a gigantic underground lair on his own property, but his visions of Bond-villain vehicular security were sadly thwarted by local zoning laws. Lauren's 60-plus vehicles are tended by a staff of four. The garage includes a a workshop and a "library," and the cars' various prizes hang on the walls (along with Lauren's key to the city of New York, we hope!) Each vehicle is road-ready. And Lauren drives them. Why cars? "You can't drive a painting," he tells Goldberger. What else would one really expect from a man whose company is worth over $8 billion? A man who, upon opening a New York store that cost $50 million to build in the middle of a recession, told Women's Wear Daily, "What this does is prove that we believe in the world, we believe in America and we believe that people want good things." Selling "good things" (and even not-so-good things, let's be honest) has been very good to Lauren: shares in Polo Ralph Lauren Corp. rose by 37% during 2010, and Lauren earned nearly $1 billion liquidating a fraction of his stake in the company. This is Lauren's 1971 Mercedes 280SE. He picked it up for $13,000, shortly after launching his namesake line. "It was an extravagance that offended his backers, given how far from profitability he was then," notes Goldberger. As though he were already the rich person he was destined to become, "I walked into Mercedes on Park Avenue and said I wanted that car, but with a tan top and tan leather seats and a silver body," says Lauren. "They told me that they didn't make it that way. But then they did it."